Wilbarston CEVC Primary School believes that all children have the right to grow up and be educated in a safe way. We take the safety, happiness and well-being of our children seriously. We demonstrate this by ensuring that all staff are trained and updated regularly. All staff have had copies of relevant procedures and information to ensure they are fully aware of their roles and responsibilities. Staff and volunteers are recruited, fully DBS checked, trained and inducted as part of the procedure of starting to work with our children at our school. Our Designated Safeguarding Lead Person is Mrs Green (Head), Miss Sheen (SENCO) and Miss Franklin (KS2 Leader) are fully trained Deputies. Their training is up to date and updated as required. If a concern is raised about the wellbeing of your child we would nearly always speak to the family in the first instance to clarify the concern. There are rare circumstances where we discuss our concern with Social Care and refer to Social Care professionals in the first instance. This is only if we jointly believe that the child’s wellbeing would be at risk if we did so. We know this procedure is worrying for families but we all have the children’s best interests at heart and the child’s safety is paramount. Mrs Holden (Chair of Governors) is our Safeguarding and Online Safety governor. She, along with the Health and Safety Committee, oversee the overall procedures and policies related to Safeguarding. We operate Safer Recruitment practices for recruitment e.g. ID checks on arrival, qualifications checked and two references in place prior to interview. Mrs Green and Mrs Holden have completed the statutory training for Safer Recruitment. Supply agencies are provided with copies of our policies and health and safety information prior to sending us staff and the Head/School Business Manager will ensure supply staff know fire procedures and also child protection procedures on arrival. We use the same companies and, where we can, the same staff so pupils know a familiar face. In Key Stage 2 (juniors) we have two qualified and experienced Higher Level Teaching Assistants (HLTAs) who are able to cover for teachers in their absence too. We regularly provide information on our newsletters about what parents can do if they have a concern about a child. Parents should contact the Multi Agency Safeguarding Hub if they are concerned in holiday periods or if they would rather speak to the MASH team. Telephone: 0300 126 1000 or click on a link below. Parents and community members have used this in the past to keep our children safe. We talk to children about their safety e.g. stranger danger, preparing for school holidays and risks, peer pressure, fireworks and Halloween activities. There are worry boxes in school to help them with concerns.We also talk to them at an age appropriate level about their own bodies. We would advise families to teach their child the NSPCC Underwear Rule and help protect them and to make sure they understand about private body parts from a young age. It's a simple way that parents can help keep children safe – without using scary words. 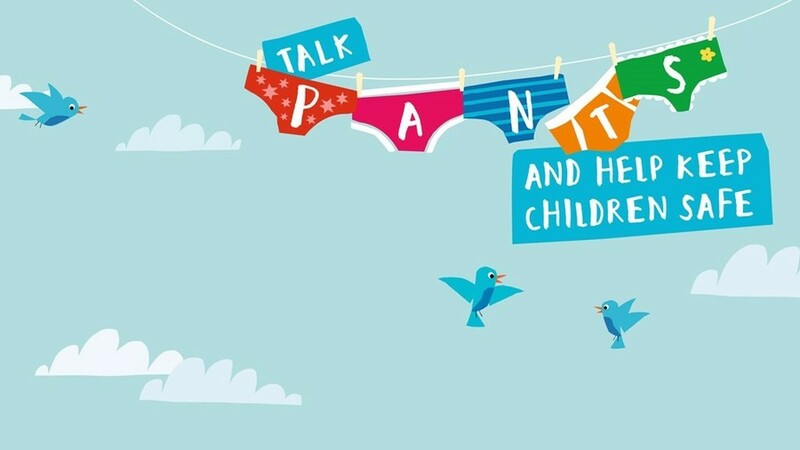 Follow this link to the NSPCC 'Let's Talk Pants' website. Talking PANTS teaches children important messages, like their body belongs to them and they should tell an adult if they're upset or worried. Teach your child the correct word for their private parts so they know them. It is useful if they have to see a doctor or nurse and helps them to be able to explain if something has happened.